Periwinkle is a happy-go-lucky small subshrub. 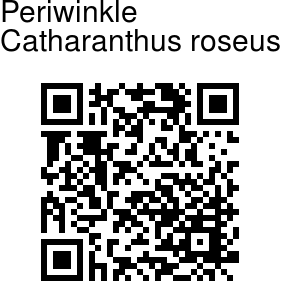 It grows in adverse conditions, rain, heat, dust. It can be quite often seen growing out of cervices of walls. It is an evergreen subshrub or herbaceous plant growing 1 m tall. The leaves are oval to oblong, 2.5–9 cm long and 1–3.5 cm broad, glossy green, hairless, with a pale midrib and a short leaf-stalk 1–1.8 cm long; they are arranged in opposite pairs. The flowers are white to dark pink with a darker red centre, with a basal tube 2.5–3 cm long and a flower 2–5 cm diameter with five petal-like lobes. The fruit is a pair of follicles 2–4 cm long and 3 mm broad. Lots of cultivars have been developed with various colors, from red to white. Medicinal uses: In Ayurveda the extracts of its roots and shoots, though poisonous, is used against several diseases. In traditional Chinese medicine, extracts from it have been used against numerous diseases, including diabetes, malaria, and Hodgkin's lymphoma. 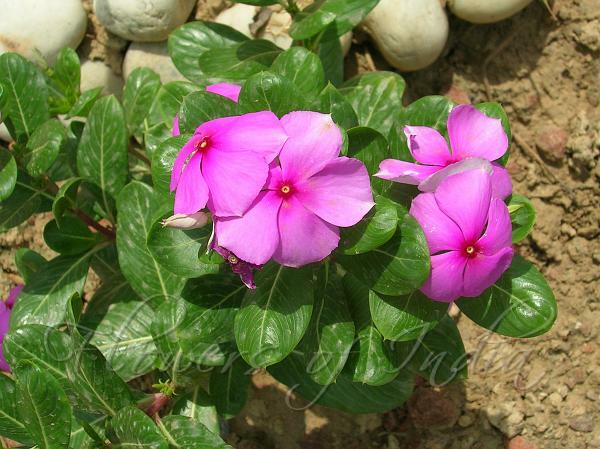 Many of the vinca alkaloids were first isolated from Catharanthus roseus. The substances vinblastine and vincristine extracted from the plant are used in the treatment of leukemia and Hodgkin's lymphoma.